Howard Miller 625-514 Emmett is a smaller 19 inch tall, contemporary Black Coffee rectangular wall clock with a 3/16" thick plate glass cover suspended on polished chrome finished buttons. The white dial features chrome finished applied bar style hour markers and silver-finished hour and minute hands. Swinging pendulum. 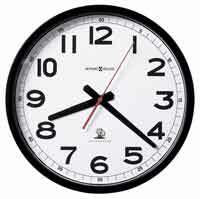 The rectangular grid-style of the frame allow the color of the wall behind the clock to be seen. Spun satin silver finished pendulum. Quartz, non - chiming battery-operated movement. 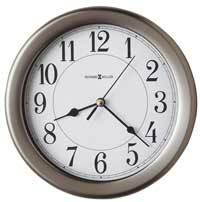 Clocks for sale at The Clock Depot including the 625-514 at discount prices.